"This is the 1999 American Pie Council 's National Pie Championship's first place winner in the Quick and Easy Category. Garnish each piece with a slice of lime and a dollop of whipped cream or whipped topping if you like." Excellent pie. We recommend using 1 cup lime juice, 4 yolks & 2 cans of condensed milk to fill the pie crust. 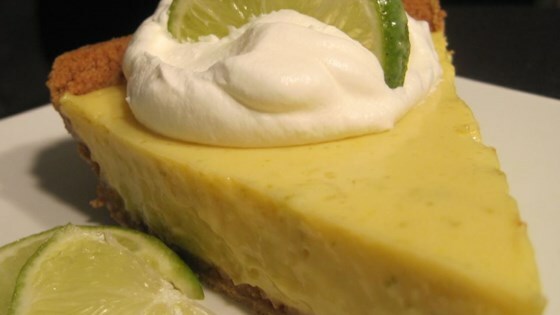 Couldn't ask for an easier, quicker, tastier key lime recipe.